Commercial and community environments rightfully attract the popular attention to demanding and improving leadership performances. However, I believe the greatest demand and rewards for achieving excellent leadership performance is in our family. Parental leadership performance is HUGE and VITAL to children’s development. 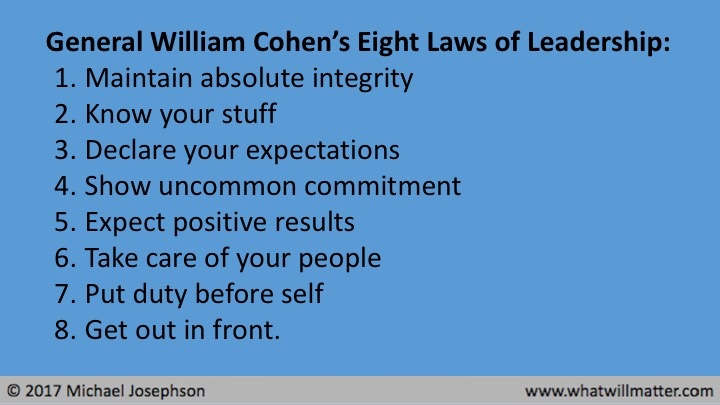 Aside from the excellent thought provoking “8 Rules” by General Cohen; I would only add “PRESENCE”. Philosophers call it 90% of parenting; but my assessment is that presence is VITAL to healthy, happy kids !!! There simply cannot be any substitute for modeling positive loving presence. How wondweful. Thanks so much because we need leaders like Me. Cohen in each & every places you look, broken with empty promises. How sad & shameful we have become….soulless characters. 1. The problem is often NOT that there are too few leaders but that there are too few good followers (individuals that know how to follow, why they are following, who to follow, ethics, etc.) Submission to a good leader is not an inferior position. Our culture does not teach submission even though the greatest leaders in history knew how to submit to a greater authority. 2. The rules of leadership are the same as the rules for being a good leader. The Leadership laws are just outstanding that all need to read and understand that are in positions of Leadership. The problems with lack of leadership today comes from the need to be liked rather than respected. Leaders must be able to stand for what is right and truthful. After teaching and coaching for 50 years we in leadership positions must help our young people realize that being truthful is a great virtue. We all must help support parents about the need to take a stand with their children to teach honesty, truthfulness and respect for authority. You cannot Lead without Integrity. Keep talking about Leadership and what it takes to Lead. Our country must continue this work.